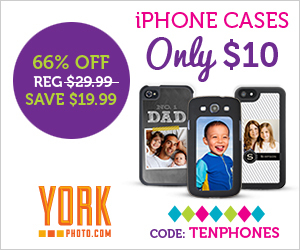 Custom Photo iPhone Case Only $10! You are here: Home / Great Deals / Custom Photo iPhone Case Only $10! Check out this great fun deal for Father’s Day! Custom Photo iPhone Case Only $10! Turn Dad’s iPhone into a work of art featuring the kids, you or a favorite vacation picture. Grab this and other great photo gifts for dad at York Photo every day!